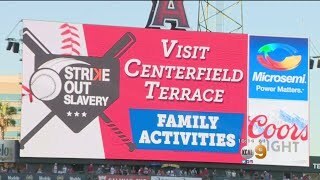 Albert Pujols' wife Deidre teamed up with the Angels to create the first "Strike Out Slavery Day" at Angel Stadium of Anaheim. 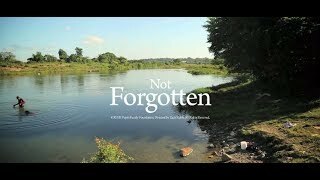 Jeff Nguyen reports. 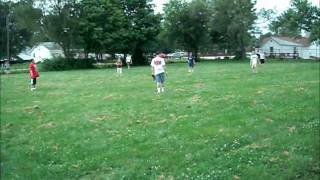 Alex hitting a homer in our July 4, 2011, family baseball game. 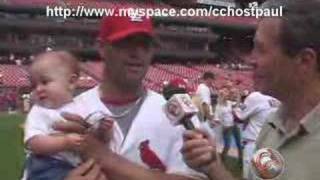 Pujols conducts interview while his daughter grabs for the microphone. 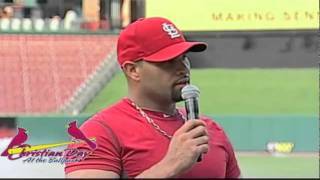 Scott Miller is with the Cardinals in Jupiter, Florida where he caught up with reigning NL MVP Albert Pujols to get his thoughts on the upcoming season. 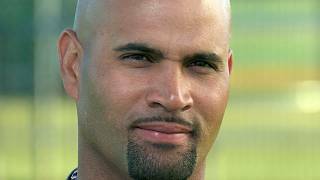 Pujols Family Foundation "Not Forgotten"
Short Film on the Pujols Family Foundation's work in the DR.
Claire O'Day interviews her dad, Darren, and asks all the important questions. 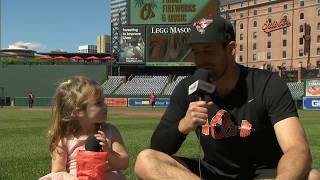 More: http://www.masn.me/orioles. 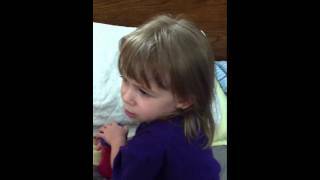 My 3 year old daughter Isabella is Albert Pujols #1 FAN!